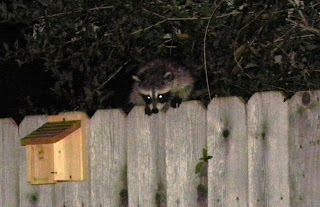 Last night around midnight Bill woke me from a sound sleep and told me the raccoons were in the yard again. A mother raccoon and her four babies were at the pond - turning over all the stones we had so carefully placed. Boy, they were cute! It took me several minutes to put something on and to get outside with my camera. 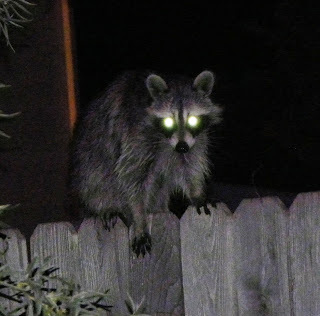 By the time I started taking pictures, Bill had made enough noise that they had retreated to the fence - but were not sure they really wanted to leave. I had no idea if the pictures I took would really show anything - I was just aiming into the darkness and shooting. I did have the flash on. 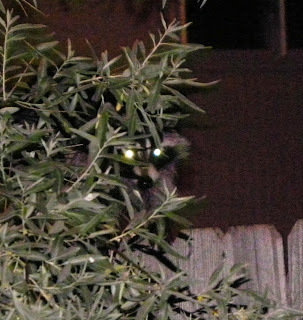 Momma raccoon is hiding behind the leaves peeking to see if I would leave so she can go back to the pond. 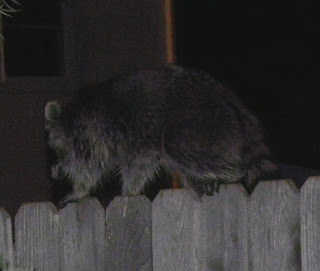 Bill says raccoons are really the squirrels we see during the day - that have morphed into raccoons during the night. Momma finally gave up and left. 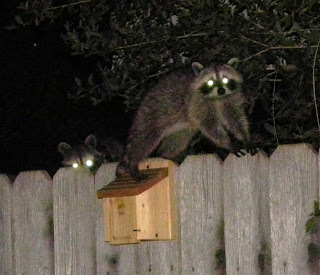 We caught them before they did too much damage and I don't think they came back after we went back to bed as things seemed to be intact this morning when we got up.